In United States, 92% people own a smartphone and the technology adoption rates have quadrupled in the past 5 years. But only 17% of the low income families have adopted technology, whereas middle income (43%) and high income families (66%) have better statistics of technology adoption rates. The use of laptops, smartphones and tablets is major among the population aged between 15 yrs. to 50 yrs., who come across the problem of size, weight and carrying multiple device charger. Dart charger is a single solution compatible with all kind of electronic charging devices. From laptops to mobile phones to televisions, dart charger can prove to be a universal charger in a compact size, available with multiple power tips and a universal adapter. In general, charging adapter of the laptops adds 40% weight of the laptop on the shoulders. The integrated AC plug eliminates the bulky cord/cables. Dart charger can efficiently convert more than 90% power and can signify the overvoltage, overcurrent and overheating situations. Goldstein Research analyst forecast that the United States dart charger market is growing at a CAGR of 1.8% over the forecast period (2017-2025). Technological innovation in dart charger, personal disposable income of consumers and compatibility with large number of products are some of the factors that may support the growth of United States dart charger market as per the forecast. 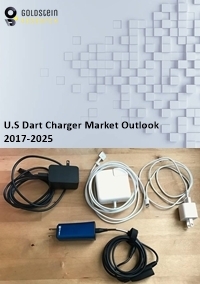 The report covers the present ground scenario and the future growth prospects of the United States dart charger market for 2017-2025 along with the unit sales and United States revenue of the dart charger. We calculated the market size and revenue share on the basis of revenue generated from major players across the globe. We have forecast the market on the basis of investments, shipment data, market presence of the players. On the basis of distribution channel, online platform accounts for major share of 65.8% in 2017 of the total United States dart charger market. Online distribution channel is expected to continue the larger market share in future. Application of dart chargers for laptops is the fastest growing segment at a rate of 1.8% annually as compared to other applications. United States dart charger market outlook 2017-2025, has been prepared based on an in-depth market analysis from industry experts. The report covers the competitive landscape and current position of major players in the United States dart charger market. The report also includes porter’s five force model, SWOT analysis, company profiling, business strategies of market players and their business models. United States dart charger market report also recognizes value chain analysis to understand the cost differentiation to provide competitive advantage to the existing and new entry players. The trend of using LED lights has enhanced the aesthetics, ambience and reduced footprint with the use of dart chargers that works on multiple times change of frequency. It aims for 10 to multi-hundred-watt, AC/DC (off-line) converters as compared to others converting 30 MHz to well over 100 MHz, thus accounts for 1000 times of the current capacity. With the rising demand for accessories of the electronic products, the trend of reducing size and weight of bulky electronic products is providing competitive edge to the players manufacturing dart chargers. The penetration of electronic products like laptops, mobile devices and others are swaying the electronic products demand, driving the United States dart charger market. The presence of local players manufacturing dart chargers is posing threat to big market players, as they supply products at low cost and low quality, which is negatively impacting the demand for dart chargers. Based on geography, North America region accounted for 38.7% market share of the global dart charger market. United States in North America region attains giant market share which is likely to expand at a CAGR of 1.8% over the forecast period. Moreover, California State of U.S. accounted for highest revenue share from the presence of major players and provides growth opportunities in future. United States dart charger market report comprises of the following companies as the key players in the dart charger market: FINsix, Nexgen, Nordic Power Converters, Cambridge Electronics, Appulse Power, Shenzhen LVSUN Electronics Co. Ltd, Bolweo, Group West International. What is the revenue of United States dart charger market in 2016-17 and what would be the expected demand over the forecasted period?